Now there’s a new way to fumigate and humidify enclosed areas. 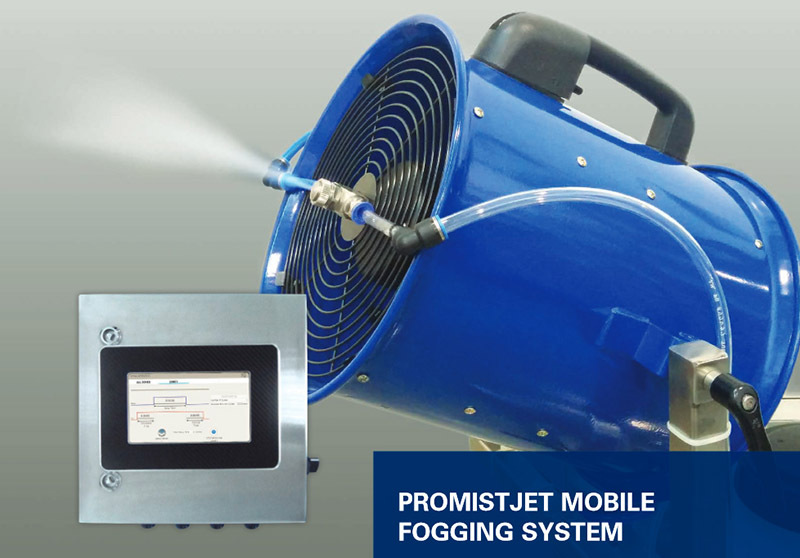 The PromistJet system produces a uniform fog and effectively covers hard-to-reach spots and surfaces. This portable system is easy to set up and operate and eliminates the use for costly high-pressure, high-maintenance pumps. Compressed air and liquid are supplied to the nozzles. The interaction of the air and liquid in the nozzles produce very finely atomized drops. The liquid is siphon-fed from a 13.3 liter (3.5 gallon) tank to the nozzles. An integral, lubrication-free compressor can be supplied with the system or an external compressed air source may be used. The atomized liquid is projected using high-velocity fans. The fine spray fog is distributed uniformly throughout the enclosed area. An easy-to-user Android-based controller is used to set spray cycles. The touch panel is housed in an NEMA 4X (IP54) rated enclosure. The spray nozzles consist of a body and spray set-up. Constructed of stainless steel and food-grade materials, the nozzles are available with a wide range of spray set-ups to accommodate a wide range of flow rates. The PromistJet is on casters and can be easily moved throughout a facility.